Everyone at some point suffers from a dead or dying battery. Here are my tips for squeezing out the last few drops of power from your battery before your laptop completely runs out of power. You’re aiming to reduce power consumption to as little as possible. Go to Control Panel\Hardware and Sound\Power Options, or search for ‘Power options’ in the Windows 8 or Windows 10 search box. Click the Power saver mode or similar. You can do even more to save power. But this is the simplest. Every component of your machine needs power for it to function. Many USB devices you plug into your laptop like hard drives, mice, phones, etc. are actually powered by your computer. Therefore, if you are running off the battery, you will likely see increased drain if devices are plugged in. When you are running low on power, try unplugging devices connected by USB. You should also look to make sure other connection methods like Bluetooth are off. Disconnecting devices should allow your laptop to last a bit longer. WARNING: Before disabling any component or device, stop and make sure that this device is not in use, and that it is not essential to continuing operation of the laptop. For example, you DO NOT want to disable the hard drive that houses the operating system, or the processor the runs the entire laptop. Only disable those devices you are comfortable turning off. For equipment that can’t just be unplugged, look at Device Manager. To disable unused devices on a Windows system, open up your system’s Control Panel and find the Device Manager. In the Device Manager, individual components are grouped by category. For example, Network adapters will often include both the LAN adapter, which provides Ethernet connectivity, and WI-FI, for wireless networking. The main choices for saving power are the optical drive (found under DVD/CD-ROM drives), and the Ethernet and Wi-Fi adapters (under Network adapters). Find the device you want to shut down within the relevant category. Right click on the device name, and select “Disable” from the drop down menu. While you’re in the Device Manager, you can also turn off any unused ports. The actual impact on battery life will be minimal, but if you need a few more minutes of life, this will help. Take a quick glance at your ports, and turn off anything that’s not being used, like USB ports with nothing connected to them. While you’ll still have to use the display and the keyboard, you can adjust the settings for each to reduce power consumption. One often overlooked power drain is keyboard backlighting (not available on every laptop). Unless you’re in the dark, and need the backlight just to make out each key, turn the backlight off entirely. You can typically assign a hotkey for this function. The next power drain is your screen. While you need to keep the up and running to use the laptop, you don’t necessarily need it running at 100-percent brightness or full resolution. Many laptops will have hotkeys for increasing and decreasing the screen brightness, but if not, it can be adjusted in the Control panel. Reducing the display to 50 percent when you’re running on battery power can add some extra time. If you know what you’re doing you could turn off unnecessary applications and processes. But to be honest, by the time you do this, you might have finished what you need to do anyway. then you could open up the Task Manager by pressing Ctrl+Shift+Esc, or use Ctrl+Alt+Del and select Task Manager from the menu. Once in the Task Manager, look at the open apps – you may find that a program or two have been left running simply because you forgot to close a window instead of minimizing it. These tips are will add to both the useful time you get out of a single charge, and extend the overall lifespan of the battery. Actually use your battery to keep it fresh. Don’t keep your laptop plugged in all the time. This can reduce the the life expectancy of your battery. It’s a good idea to discharge it (drain completely through normal use) and then recharge your laptop battery about once a month. Also, you should let your battery run down before you recharge it. Finally, keep things cool. Heat will shorten the long-term life of the battery, so take steps to provide optimal airflow and cooling. The biggest problems come from physical obstruction of the ventilation ports. Dust buildup is one problem, which you can take care of by cleaning the laptop’s vents and fan. A can of compressed air can be used to blow out some of the dust (when the machine is completely turned off). The more frequent issue that crops up is using the laptop on a pillow or blanket, which can both obstruct the ventilation fan and retain heat from the laptop. This can be avoided by only using your laptop on surfaces like a table or desk, and a lapdesk or board will make a big difference when using a laptop in bed. Have a look at my other cooling tips. Finally, the easiest way to ensure that you always have enough battery power is to bring along an extra; either a spare battery or an external battery pack. For laptops with a removable battery, the simplest option is a second battery. These can either be ordered directly from the manufacturer, or purchased from a third-party company, often for less than for £20 if its an OEM third party battery. Have a charged up battery waiting in your bag as a back up power supply whenever you expect to be away from a power socket. You can buy a spare battery from my Amazon store. You’ll need your laptop model, and the part number of your battery (printed on the battery itself, visible when your remove it from the laptop). For starters, regularly defragment your hard drive to make data retrieval more efficient. (Note: DO NOT try to defrag a solid-state drive, as it will reduce the usable life the drive.) An active drive uses more energy that an idle one, and defragging your hard drive reduces the amount of active drive time needed to access data. Over time, as you add and remove files from your system, data is haphazardly recorded to the hard drive, scattered in different portions of the drive. This disorderly (or fragmented) data, requires additional time and energy to access that information in the course of regular use. Defragmenting your drive is the digital equivalent of sorting out your cupboards, making everything a bit tidier and easier to find. Windows 7 and Windows 8 both have automatic tools that defragment your drive on a regular basis, but you should at least check to be sure that this is enabled and running properly. Decluttering your drive will also make it more efficient. Practice good computer hygiene and regularly remove unwanted programs, clean out old files, and ditch any excess ‘bloatware’ that came with your system. Your cleanup should also include cleaning out the cache on your Web browser and deleting all of the old files from your downloads folder. (Bloatware: programs that are pre-installed on new PCs, many of which are ‘lite’ or limited trial versions designed to entice new users to buy or subscribe to the full-featured versions). 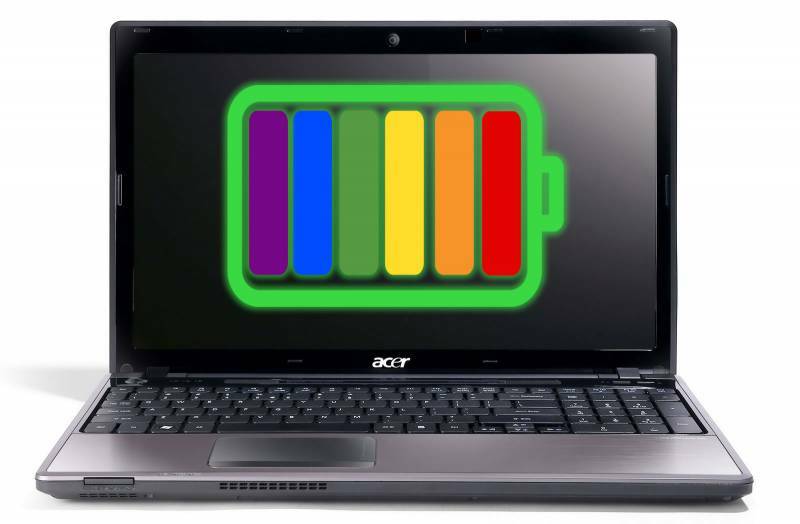 Upgrading specific parts of your laptop will help you get more from a single charge. But these tips are only for those who both want increased performance and running off battery power longer, and are willing to spend some money. One option is to ditch the hard drive entirely, and upgrade to a solid-state drive (SSD). Solid-state drives use flash memory instead of a spinning disk, so there are no moving parts, automatically offering more energy efficiency. It also removes the problems associated with fragmentation, which is a larger problem with hard drives. Upgrading to an SSD will both improve your battery life, and put some pep in your system, as SSDs offer faster performance and boot times than their traditional counterparts. The other main option is seek to add some more RAM to your system. RAM stores data for short term use in flash modules, much like an SSD. The more data that can be put into RAM, the less reliant the system will be on pulling that data afresh from the hard drive. Again, reducing hard drive activity reduces the power consumption, but like an SSD upgrade, adding RAM also has performance benefits that you will notice immediately. I can help with installing new components. Please contact us if you need help with any of the above tips.